Early December – TUBIZE – During a robbery in a jewellery, a youngster, Flavien (16 years), is killed by the owner of the jewellery shop. The robbers were two, they had fake weapons with them. The owner used his hunting rifle to kill one and to hold the other one, Hassan, till the police arrived. Hassan is now in prison and refuses to collaborate with the police. A few days later, friends of Flavien organised a march to commemorate their friend and to march to the jewellery. About 100 youngsters showed up next to the small city centre . The Federal Police and anti-riot squads were very present and blocked the centre completely, while the mayor prohibited all gathering. At the beginning of the march, some people started to attack the cops with stones. Then the family of Flavien arrived, asking for calm and saying literally “we are not here to make revolution”. The march ended therefore calmly. 8/12/2010, Tubize: car put on fire in the “Street of Democracy”. 8/12/2010, Charleroi: three cars put on fire. 9/12/2010, Jemeppe: five cars put on fire on different spots of the small city. 9/12/2010, Ottignies: car put on fire on the parking of the station in the “Lane of Human Rights”. 9/12/2010, Liège: four cars put on fire on different spots. Suie et Cendres – Belgium news of social war. “A man charged with the attempted murder of two police officers was remanded in custody today after hurling abuse from the dock. Unemployed John Paul Onyenaychi, 30, is accused of stabbing Pc Paul Madden, 23, and Piotr Dolata, 27, a police community support officer (PCSO) on Wednesday (15/12/10). The two officers were injured at a bus stop in New Broadway in Ealing, west London. PCSO Dolata’s life was saved by a quick-thinking doctor who was passing by and was able to stem the bleeding. Onyenaychi, of east London, was also charged with attempting to cause grievous bodily harm against a second PCSO, Steven Constable. Surrounded in the dock by 10 police officers at Brent Magistrates’ Court, Onyenaychi refused to confirm his name, date of birth and address before launching into an expletive-filled tirade. Dark Nights is an irregularly published anarchist & anti-prison freesheet of resistance reports and repression news to download and print out. This issue covers the calls for solidarity coming from Greek prisoners on hungerstrike, members of armed groups Revolutionary Struggle and Conspiracy of Cells of Fire, imprisoned for their actions, and those in clandestinity, who call for increased escalation of the social war. – International call for solidarity from members of Revolutionary Struggle. / About the emergence of the new generation of armed revolutionary struggle and the economic era of ‘crisis’. – Fire to the State: Letter from Gerasimos Tsakalos & Panagiotis Argirou + International Solidarity Call by Conspiracy of Cells of Fire. / Claim of responsibility and anarchist declaration by two imprisoned fighters of the armed group Conspiracy of Cells of Fire, plus a call for an international campaign of revolutionary solidarity to tie in with a trial in January against the group. – Ongoing mass prisoners hunger-strike in Greece. / About the continuing widespread refusal of food in Greek prisons plus the communique from the prisoners initiative about their demands. 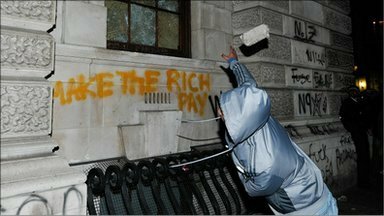 The atmosphere of UK State repression and ‘queen’s peace’ was definitively broken on the 10th November 2010, when the Millbank Tower, Conservative Party HQ, was stormed by a mob of malcontents, during a demonstration against student fees. As usually goes with the justice of the system, things turned badly for the comrades on trial: not only have some of the requests of the public prosecutor been accepted but those who had been acquitted in the first grade of the trial have also been charged. We are three political prisoners, members of the armed group Revolutionary Struggle [Epanastatikos Agonas], and we send you militant greetings from the Greek prisons. We were arrested in April 2010 along with other three comrades who are being accused of involvement in the organization. Since then, we have been on pretrial detention [under the terrorism act], waiting to be referred to a trial in the first months of 2011. On a recent evening the Sodexo factory in Montreal, PQ was attacked with rocks and spraypaint. Sodexo is a company which manufactures and distributes food to prisons across Canada. This act is a retaliation against the industry and apparatus of imprisonment but also an expression of solidarity, with all prisoners but especially with Roger Clement, recently sentenced to 3.5 years for an attack on a Royal Bank of Canada, John Graham, an indigenous prisoneragainst the colonial state and Giannis Dimitrakis, jailed in Greece for his activity as an anarchist against the state, serving 25 years. L’usine Sodexo à Montréal a étés attaqué avec des roches et du graffitti. Sodexo est une compagnie qui fabrique et distibue de la nourriture pour les prisonsà travers le Canada. Cette action n’est pas seulement une attaque contre l’industrie de l’emprisonnement, mais aussi une expression de notre solidarité avec Roger Clement, qui vient de recevoir 3.5 ans en prison à cause d’une attaque sur une Royal Bank of Canada, avec John Graham, un prisonnier autochtone contre l’état colonial, et avec Giannis Dimitrakis, emprisonne pour 25 ans en Grèce pour son activité contre l’état en tant qu’un anarchiste. 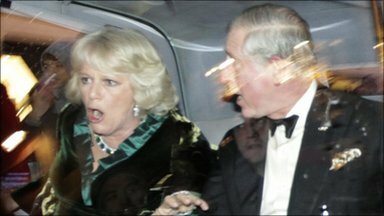 The Royal couple were attacked in their vehicle by the rioters. Soon the revolutionary violence will encompass broader sections of society as the fightback against the weak Coalition government gathers pace. These initial clashes will pale in comparison to the coming social struggle which will make serious attacks on the British establishment, the Rich, and their way of life. The barriers between those in struggle are coming down, our violent resistance finds new accomplices ready to attack the conditions in their life which make them miserable: State & Capital. Cops, prisons, politicians, bosses, work, nationalism, dead-time : All must go – Ignite the peripheries of conflict and widen the struggle into new areas. Decades of racist and brutal policing against the young people of the UK will spread a far-reaching fury burning with a new intensity, spreading through the generations, fueled by the anti-political sensibilities of a new generation of radicals who will not regurgitate the recuperative lies and deceit of the social activists or the political Left, and who will seek to attack directly the class enemy, organising themselves as they see fit. For future attacks against capitalism, monarchy and the state – For social insurrection. Solidarity with all imprisoned fighters everywhere. Attack against Halifax bank in solidarity with Giannis Dimitrakis.